Cypripedium candidum Muhl ex Willd. The pleasing aroma of this species attracts small solitary bees. The bees enter the pouch of the flower but find no nectar to reward them. 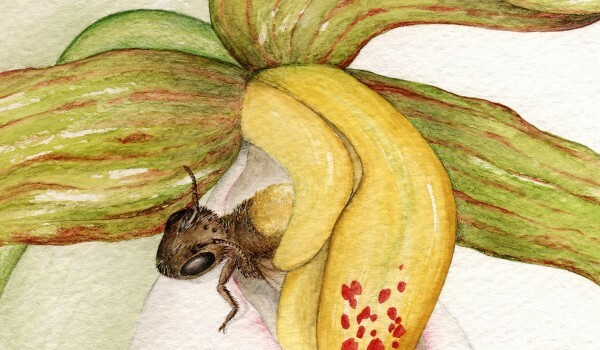 Trapped inside the ‘slipper’, the bee can only exit via the back of the orchid. As the bee passes through, pollen is deposited on its’ back where it will rub off onto the next plant it visits. 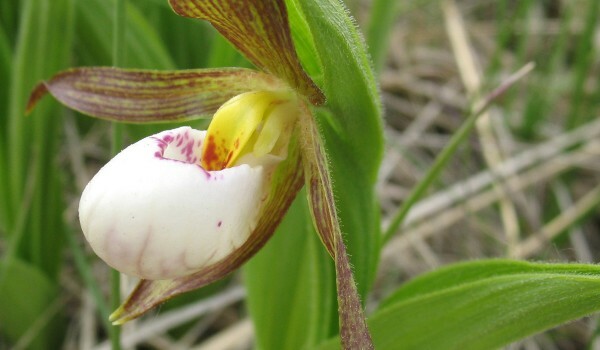 This endangered orchid is found in moist grasslands of southern Manitoba and Ontario, and the northeastern U.S. Protected under Canada’s Species at Risk Act, Manitoba’s Endangered Species Act and Ontario’s Endangered Species Act. The collection of wild plants and seeds is illegal on public lands. This perennial grows to 40 cm tall, in clusters of 3-60 stems from an underground rhizome. It has 3-6 alternate, v-shaped leaves. Flowers occur singly, and have three petals: one is white with red flecks forming a pouch (or slipper) and the other two are greenish purple and twisted. 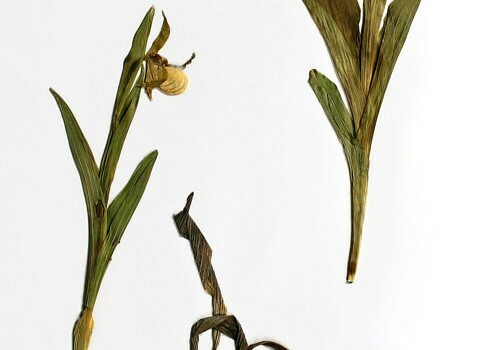 There are three yellow-green to brown sepals (two fused at the bottom of the slipper and one at the top) and a conspicuous bract. The fruit is a capsule that splits open to release thousands of small seeds. Do not purchase wild-collected seeds or plants. Seeds and/or plants from nursery-raised stock may be available.